Cogeco Communications is the fourth-largest cable company in Canada and owns quality cable assets in the United States. The company should be able to continue its growth on both sides of the border, thanks to internet subscribers growth and its Gbps internet offerings. Cogeco pays a 2.2%-yielding dividend. 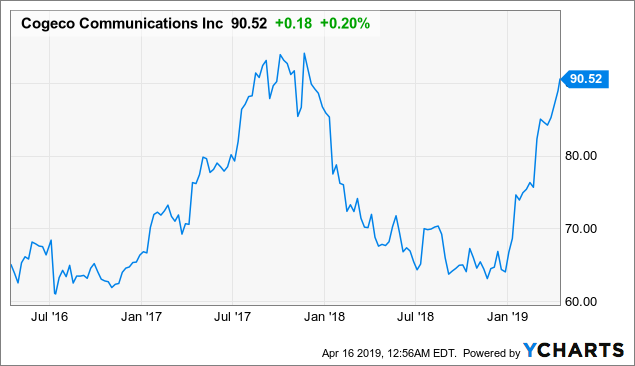 Cogeco Communications (OTCPK:CGEAF, TSX:CCA) delivered solid Q2 F2019 with top and bottom lines growth. The growth was primarily driven by its internet businesses on both sides of the border. This momentum should continue in the rest of 2019. Despite a surge in its share price in the past few months, the shares are still trading at a discount to the peers. Cogeco also offers a growing dividend with a yield of 2.2%. We believe this company is a good choice for conservative investors seeking both capital gain and dividend growth. Cogeco posted solid Q2 F2019 earnings. In the quarter, the company saw its revenue increased by 10.2% year over year, primarily driven by its acquisition of MetroCast in the United States. As can be seen from the table below, its revenue increased to C$584.1 million. The company's adjusted EBITDA margin also expanded to 48% in Q2 F2019 from 46.9% in Q2 F2018. 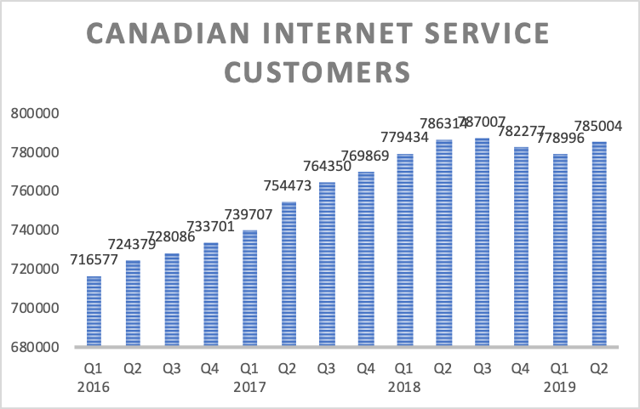 After two quarters of internet subscriber declines, Cogeco’s Canadian internet subscribers increased by 6,008 in Q2 F2019. For readers’ information, the company initiated to replace its 22 legacy systems with a new customer management system in its Canadian operation back in Q3 F2018. Unfortunately, system replacements took several quarters and has resulted in congestions in its customer support. This has impacted the number of new internet activations negatively. Now that Cogeco has replaced its legacy CMS, the issue is now in the rear-view. 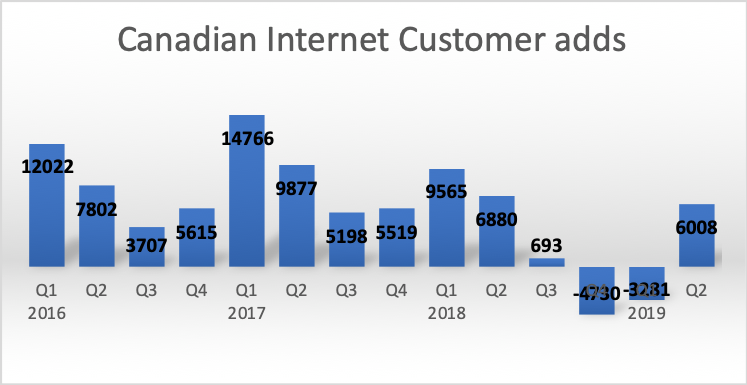 As marketing campaigns ramp up, we expect positive internet subscriber adds in its Canadian business throughout the year. In addition, Cogeco’s CMS upgrade will result in operational savings and improve its operating margin. Besides its CMS upgrade, Cogeco continues to upgrade its gigabit speed to its areas of operation in Canada. The company is now able to offer Gbps internet in 40% of its Canadian footprint. Management expects that 60% of its footprint in Canada will have gigabit Internet coverage by the end of F2019. We think this will help the company to maintain its competitive position in the market. 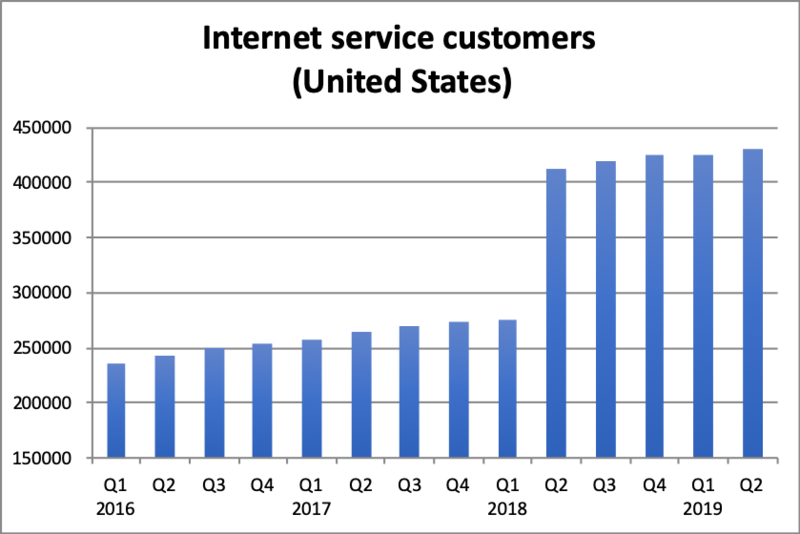 As its customers gradually upgrades to higher-speed internet services, it will also result in growth in revenue and improvements in EBITDA margin. Cogeco’s U.S. internet business continues to perform well. The company added nearly 4,000 new subscribers. In addition, the rate increase in H2 2018 has helped the company to grow its revenue and improve its margin further. As a result, its EBITDA margin has improved to 45.5% in Q2 F2019 from 44.3% in Q2 F2018. Compare to its competitors, Cogeco holds a competitive advantage, as it is able to offer Internet speeds of 200Mbps in most of the footprint and 1Gbps service in over 50% of the footprint. 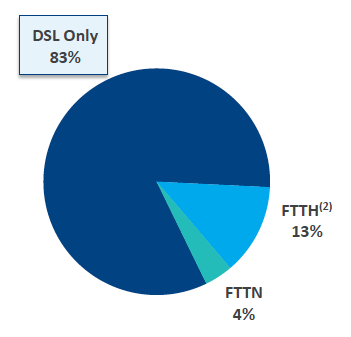 On the other hand, 83% of the footprint that its competitors operate (excluding Florida) still uses legacy DSL network. Back in February 2019, Cogeco announced that it has reached an agreement to sell Cogeco Peer 1 to Digital Colony for C$720 million. The transaction is accretive, as Cogeco was able to sell it at a price-to-EBITDA ratio of about 9x. Besides the sale price, we also like the transaction as Cogeco Peer 1 is a low-growth business. The divestiture will help improve Cogeco’s growth outlook. 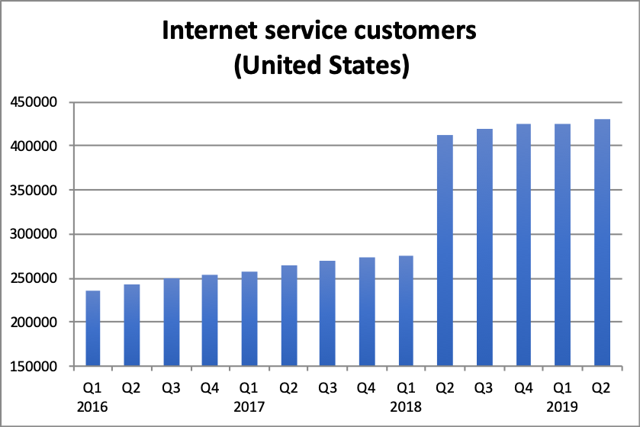 In addition, its valuation should improve, as investors will be able to gauge its faster-growth internet business. The share price of Cogeco has surged over 37% since the beginning of the year. As a result, its forward EV-to-EBITDA ratio has also expanded by about one multiple to 7.8x. This valuation is still below its peers. As can be seen from the chart below, Cogeco’s valuation is below that of Shaw Communications (SJR) and Quebecor’s (OTCPK:QBCRF) 8.2x. It is also below that of its U.S. peers. 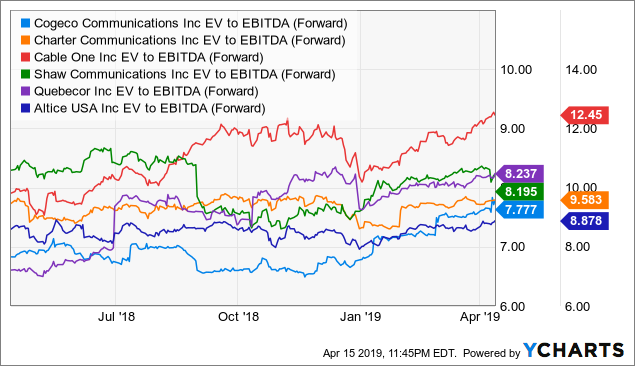 For example, Charter Communications (CHTR) and Altice USA (ATUS) trade at EV-to-EBITDA ratios of 9.6x and 8.9x respectively. Cogeco currently pays a quarterly dividend of C$0.525 per share. This is equivalent to a dividend yield of 2.2%. As can be seen from the chart below, the company has consistently increased its dividend in the past. In fact, it has increased its dividend by a compound annual growth rate of 11% since 2015. Like many other cable companies, Cogeco’s legacy TV business continues to face structural headwind as consumers gradually switch to other platforms such as IPTV. 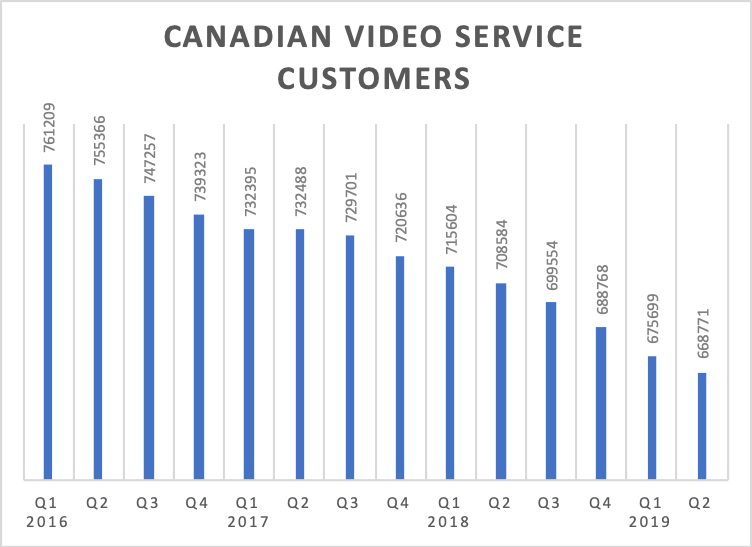 As can be seen from the chart below, its Canadian video subscribers continues to decline quarter over quarter. If this cord-cutting trend accelerates, it can further erode the company’s revenue. In Cogeco’s Canadian internet business, its main competitor BCE Inc. (BCE) continues to upgrade its fiber-to-the-home network. With the deployment of FTTH, BCE can compete head to head with Cogeco’s Gbps Internet services. As a result, Cogeco’s competitive advantage in broadband Internet speed is expected to diminish gradually in 2019. This may result in margin compression if competition intensifies. Cogeco should be able to steadily grow its top and bottom lines, thanks to growth in its internet business. Despite share price appreciation year to date, the company remains undervalued. We believe its shares are still attractive at this level. 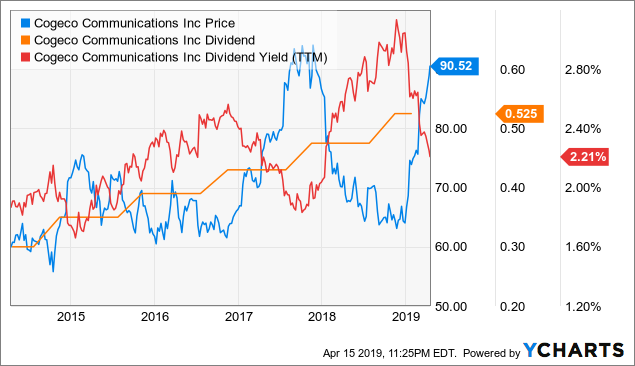 This stock continues to be a good choice for dividend investors with a long-term investment horizon. Disclosure: I am/we are long SJR. I wrote this article myself, and it expresses my own opinions. I am not receiving compensation for it (other than from Seeking Alpha). I have no business relationship with any company whose stock is mentioned in this article.